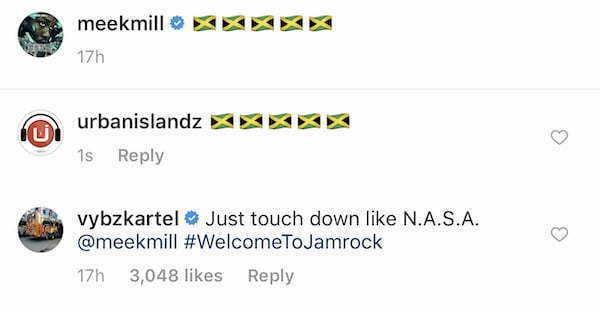 Vybz Kartel is welcoming Meek Mill to Jamaica aka Gazanation. The Philly rapper is currently vacationing in Jamaica with his Dreamchasers crew, and local fans and celebrities have welcomed him with open arms including incarcerated dancehall artiste, Vybz Kartel. 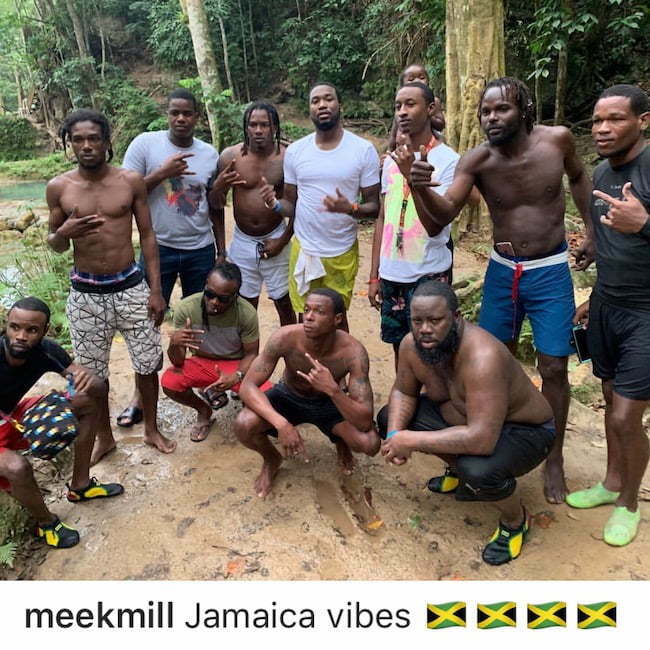 Meek Mill has been updating his followers on Instagram about his movements in Jamrock including his visit to some favorite local spots like the Beach and the famous Blue Hole and Dunns River Falls. On Monday, Meek Mill boarded a private jet from Philadelphia to Montego Bay, Jamaica where he has been staying for the past few days. He posted a photo of the plane on his Instagram, and that got a lot of his Jamaican fans excited. Vybz Kartel was among the many folks who leave comments on the post welcoming the “Championships” rapper to the island. “Just touch down like N.A.S.A @meekmill Welcome to Jamrock,” Kartel wrote. Considering that he is behind bars, Vybz Kartel sure is in the know due to his “alleged” access to social media. For his part, Meek seems to be enjoying the sunshine in Jamaica especially with two-thirds of the United States including in native Philly is under severe winter weather due to a polar vortex. The rapper is currently enjoying some down time before hitting the road for a major upcoming tour to promote his new album “Championships.” It’s unclear if he will be doing some recording while on vacation in Jamaica. There are also some rumors claiming that Meek will be visiting Vybz Kartel in prison, but our sources told us those rumors are false. In December, we saw Drake and DJ Khaled touching down on Jamaican soil for vacation. Aside from taking his family on vacation, Khaled did some recording with Buju Banton and Sizzla Kalonji for his upcoming album, Father of Asahd, due sometime this year.